Famous for its towering skyscrapers, historical landmarks and bustling streets, New York City, otherwise known as “The Big Apple” is one of the most popular destinations spots in the world. Home of the Empire State Building, the Statue of Liberty, and Times Square, New York City boasts iconic landmarks that are second to none. Elite Airways offers non-stop flights between Newark and Vero Beach, Thursdays and Sundays, starting December 10, 2015. Inbound flights from Vero Beach arrive in Newark at 9:00 a.m. Southbound flights depart Newark at 1:30 p.m. and arrive in Vero Beach at 4:15 a.m. Click here to check flight availability. Newark Liberty International Airport is located at 3 Brewster Road in Newark, New Jersey. The ticket counter is located in Terminal B, Level 3, by Door Number 4 and Porter Airlines. Arriving passengers may collect their baggage at Level 1, Carousel 1 (unless directed otherwise). Click here for airport website. The greater New York City area is home to some of our country’s most popular landmarks and attractions. Transportation options range from taxis and ferry boats to subways and trains. Double decker tour buses offer scenic views of skyscrapers, city streets, parks and museums. Click here for more information. 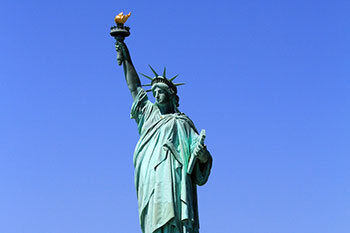 New York City's five boroughs are home to some of the world's most recognizable and cherished landmarks and attractions. From Times Square and Central Park, to the Empire State Building and One World Observatory, the island of Manhattan packs more famous buildings, parks and attractions into one compact area than any other place on earth. That’s of course to say nothing about the City's four other boroughs—The Bronx, Brooklyn/Queens and Staten Island—each of which contains its own roster of must-see destinations. 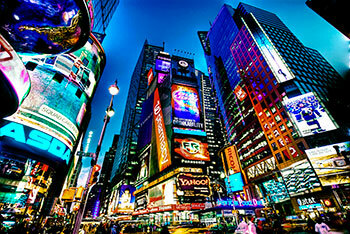 New York City, home of Broadway and Off-Broadway, is the theater capital of the world. First-run plays and musicals offer a wide spectrum of plots, from drama to comedy. Revivals feature your all-time favorites. 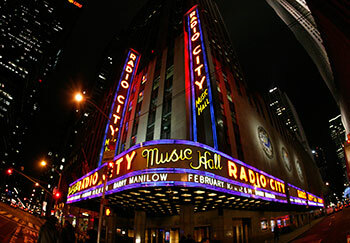 Enjoy music, ballet and opera at Carnegie Hall, Lincoln Center, Radio City Music Hall and other venues. Holidays bring annual favorites like the Rockettes Christmas Show at Radio City Music Hall to the New York Ballet’s presentation of the Nutcracker at Lincoln Center. Explore the great galleries of the Metropolitan Museum of Art, American Museum of Natural History, Museum of Modern Art, Guggenheim Museum and Intrepid Air and Space Museum. From the Statue of Liberty and Ellis Island to the Apollo Theater to the Empire State Building and Brooklyn Bridge, New York City offers a plethora of rich history filled monuments to a rich history of one of the world’s greatest cities. Visit Grand Central Station with its Beaux-Arts architecture, historic rail gateway to New York City and the largest train station in the world. Wander through Central Park, designed by by Frederick Law Olmsted and Calvert Vaux, and watch miniature sailboats and rowers on the lake or see free concerts on the lawn. Marvel at St. Patrick’s Cathedral, the first large-scale medieval-style church built in U.S.
And don’t miss the Freedom Tower, at 1776’ tall, the tallest building in the Western Hemisphere. The 104-story supertall structure shares a numeric name with the North Tower of the original World Trade Center, which toppled during the terrorist attacks of September 11, 2001. Visitors can also explore the 9/11 Memorial at the base of the Freedom Tower.